The following is an interview with the Head of the Policy Implementation Department of the Ministry of Energy of Mongolia Ts.Bayarbaatar about various hydro power plant projects and international responsibilies of his country. On March 30-31 Ts.Bayarbaatar took part in negotiations with Russia at which Mongolia refused to make open to Russian side impact assessment process of planned hydropower dams on the Selenge river. This text exemplifies prevailing way of thinking about development in the in certain ruling circles. Recommended eye-opening reading for any international donor agencies and diplomats ever considering to donate\lend money to Mongolia. The funding for Eg River Hydro Power Plant project was resolved at the plenary session of the government a month ago. Can you tell us how the project is progressing? Eg River Hydro Power Plant is a very significant project for providing Mongolia’s national security, comfortable living conditions for the people, and sustainable conditions for Mongolia’s industrial development and energy sector.. We’re attempting to work on water along the river flow and turn it into a product. In other words, our objective is to turn water into energy before it flows out of Mongolia’s land and border. Water energy is very cheap. Although the initial cost for construction is high, the price of a kW is NOT cheap. Mongolia is importing energy at high prices because the variation between the evening workload and the night’s low workload is 300 MW. The price per kW is rising as electricity is distributed for high prices to eliminate this variation gap. The current price per kW of energy is 190 to 200 MNT(9-10 cent). Secondly, Mongolia simply lets water flow away to Russia. Stability of Mongolia’s general and water system will improve and become independent from other countries if we transform water into energy. Wind farms suddenly stop working when there’s no wind. This hydro power plant offsets this issue. A hydro power plant is absolutely crucial as wind farms and hydro power plants operate with adjustment regime to make up for each other’s loss. In 2014 Mongolia imported 20% of energy it consumed: 6% from Russia and 14% from China. Russian energy covering peaking needs had cost of about 7-11 cents /KWth and thus Mongolia paid to Russsian InterRAO Co. about 35 million USD. To build Egiin Gol hydropower plant Mongolia seeks 1 billion USD soft loan from China Eximbank, likely associated with 6-9% annual interest. In dangerously optimistic "no climate-change" scenario Egiin Gol hydropower plant may annually produce 500 million KWth. Even if sold to the grid at "high Russian price" it will annually earn not more than 50 million USD, which means that this money may be insufficient even for repaying the loan interest… It is a questionable price for "energy independence". Russians are strongly against the construction of Shuren Hydro Power Plant. Aren’t they cautious because it’s actually harmful to the environment and ecology? Recently, the Deputy Minister of Natural Resources of Russia visited Mongolia along with 20 representatives, and met with 16 representatives of Mongolia, led by Deputy Minister of Environment and Green Development M.Khurels. 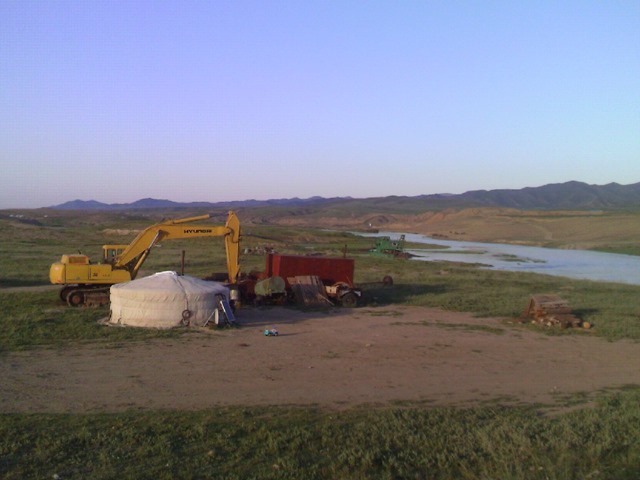 Eg River is located in Khuvsgul Lake and Egiin River basin, so it’s under Mongolia’s ownership. Therefore, it means that it’s Mongolia’s issue. It’s completely unrelated to Shuren Hydro Power Plant. The Russian side said that Mongolia doesn’t have legal basis for constructing Shuren Hydro Power Plant and that it’ll negatively impact on the ecological balance of Lake Baikal, which is registered in UNESCO. Mongolia hasn’t actually constructed it yet. The decision to construct the hydro power plant hasn’t been made. We’re only trying to make a feasibility study to see what would happen if it’s built. It’s rather rude to treat Mongolia in this way when nothing has been done. Still, we reached a mutual understanding on this and agreed to exchange information and have a feasibility study made first, and later, introduce it to the Russian side. Truthfully, Mongolians are people without water. Therefore, our people shouldn’t die of thirst to keep intact and ensure the integrity of another country’s lake. Why can’t we turn our water into a lake and make the environment green? If it’s necessary, we have to use our water sources for drinking water. I consider this treatment from Russia as a blatant attempt to interfere in Mongolia’s internal work. – Bayarbaatar neglects global value of Lake Baikal, protected by several conventions signed by Mongolia and sacred in the eyes of ordinary Mongols. – He omits the fact that in 2006-2007 Russia and Mongolia reached a firm agreement to jointly assess dam projects on Selenge and specifically to start with discussion on Egiin gol project. (2nd Meeting of Bilateral Environmental Commission, April 2008). – He completely violates logic reasoning : if now Mongolia wants to start building Egiin gol Hydro without any joint assessment of feasibility study completed in 2014, then the intention to " try to make a feasibility study to see what would happen if Shuren dam built" does not look innocent at all. It is quite regretful that Russian side did not insist on participating in this planning process and agreed to wait to see the result. – Finally Bayarbaatar should know that hydropower does not quench thirst- it produces electricity not water, therefore his populist slogans are inappropriate. What are the expectations for Eg River Hydro Power Plant? Eg River Hydro Power Plant has a capacity of approximately 270 MWs. We’ve already made feasibility studies and created all conditions for establishing agreements. We’re currently working actively on construction and development after raising investment. Constructing the hydro power plant will become a big booster for the development of Mongolia’s energy system, as well as production. It will open opportunities for developing renewable solar and wind energy, and strive towards green development. It’ll take five years to build. Our Comment: Projects intentionally escaping proper impact assessment and development that may inflict lasting harm on Selenge River and Lake Baikal should not be called "green" by any means. Also, Mongolians and some NGOs have completely wrong understanding of this issue. They’re all so worried and concerned. Do they want to die of thirst? People come up with unimaginable nonsense and stir trouble. We, Mongolians, must stay together – unified. OurComment: This echoes threatening "patriotic" language used by President Elbegdorj and Premier Saikhanbileg – all these folks openly declare that those who disagree with them on matters of international (and domestic) policy of Mongolia are "anti-Mongolian". When it comes to interpreting limits to freedom of speech recently high officials of the Mongolian Democratic Party in their wording (if not deeds) out competed colleagues from the China’s ruling party. Is it true that Eg River Hydro Power Plant has 20 times the capacity of Durgun and Taishir Hydro Power Plants? That’s right. Those two power plants have a capacity of 12 MW. A huge uproar was stirred when they were being constructed. Mongolia was experiencing severe drought from 2005 to 2008. At the time, we had Zavkhan River filled with water. Now, a big man-made lake has been created there. Zavkhan River has become such a beautiful lake now. There’s always an obstacle when something is started. Honestly, Govi-Altai and Zavkhan Provinces are alive because of those two power plants. Everyone who visits Zavkhan River is amazed to see what a wonderful development it has become. Are Durgun and Taishir Hydro Power Plants able to work at full capacity? Yes. Out of the 37 MW of electric power supplied from the western region, seven to eight MW is produced by Durgun Hydro Power Plant. In other words, Durgun Hydro Plant is supplying 20 percent of the energy consumption of the western region. Taishir Hydro Power Plant is largely dependent on the water level of Zavkhan River. The lake is filling up well since recent years have had plenty of precipitation. If too much water flows out, the water level of the lake will lower and production will decline. Zavkhan River will face a danger of shrinking if the water level is too low. People and livestock drink from the river, so the ratio is adjusted. Taishir Hydro Power Plant works with a capacity of nine MW when necessary. Normally, it operates with a capacity of four to five MW. The government ordered to intensify the construction of Erdeneburen Hydro Power Plant Project at Khovd River. How is this project getting along? The feasibility study for Erdeneburen Hydro Power Plant was made in 2007. At the time, the estimated cost for constructing a hydro power plant with a capacity of 220 MG at Eg River was 350 million USD. Subsequently, some 290 million USD was estimated for constructing Erdeneburen Hydro Power Plant (67 MW). We halted the project because it was a power plant with low capacity with high costs, and ultimately economically inefficient. A new feasibility was made recently. It was considered that building Erdeneburen Hydro Power Plant would be useful to the local area if the cost is reduced and its capacity is slightly increased. Its capacity has been enhanced to be 87 MW. A while ago, the government discussed this issue and enlisted it in the concession agreement list. Also, a project unit was formed and it was decided that works included in highlighted parts of research works and feasibility studies would be started. Our Comment: Hydropower dams built and planned on fragile rivers of Western Mongolia are unfortunately unattended by conservation organizations/ This happened after Mongolian government completely disregarded predictions of negative consequences for Taishir and Durgun power plants. Those projects led to suffering and migration of local herders and have inflicted many ecologiccal disruptions. Since lessons were not learned and dissent silenced, damming Hovd river is likely come aat even higher environmental and social cost. Is it true that another hydro power plant will be funded by the Turkish government? Yes. A hydro power plant will be constructed with investments from the Turkish government at Khovd River in Bayan-Ulgii Province. The project unit made feasibility studies and had it approved by our scientific and technological advisory. At Khovd River, one hydro plant will be established in Bayan-Ulgii Province and another in Erdeneburen soum. It doesn’t matter as long as they have sufficient funds. It would be difficult if all these development work leave a huge debt to us and our future generations. The Turkish government said that Mongolia will not have to give money and the hydro power plant will be constructed with a loan. It would be problematic if Mongolia’s debt continues to increase. I’m sure the Mongolian government is thinking of something for resolving this. Our Comment: We recently discovered that the Turkish firm proposing those dams is ZTM Co. is most known for road design in Turkey and Libya during last years of Gaddafi rule. They also also planned ski-slopes for Sochi Olympics in Russia-place notorious for large-scale corruption and huge environmental violations and impacts. But the most important is that the ZTM have never done full design for a hydropower station. Tons of foreigners are attempting to use this time when Mongolia’s facing energy and electricity shortage to come to Mongolia through a concessional agreement and development work. Yet, the consumption of Mongolia isn’t that high. In other words, Mongolia can carry on until 2030 if we have 1,000 MWs of power. According to the estimations of development works that people want to do, 3,000 to 4,000 MWs will be produced. Ultimately, Mongolia will fall into debt if so many power stations are built without plans and calculations. We need to construct few low-cost power stations in locations that are absolutely in need of energy. Source: "Ts.Bayarbaatar: Mongolia shouldn’t die of thirst to maintain another country’s lake"